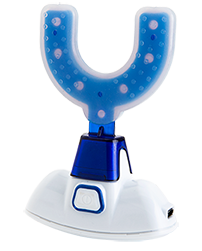 PROPEL Orthodontics’ VPro5 delivers gentle vibrations to complement your clear aligner orthodontic treatment. Used for just five minutes per day, the VPro5 helps ensure that your aligners fit properly, making your treatment as efficient and successful as possible. Clear aligners are maximally efficient when they’re seated correctly, meaning the aligners are gripping the teeth properly. If the aligners don’t have a good grip, your teeth will not move into their ideal positions. When teeth don’t move as planned, the length of treatment is increased. To use the VPro5, simply bite down gently on the mouthpiece while wearing your aligners. There is no need to bite or clench any harder than as needed to support the device. The device will slowly ramp up to full vibration and automatically shut off after the duration of treatment.